The current gas contract was negotiated in 1996 under the MSZP-SZDSZ government at the time. Hungary pays what is in the contract signed by the MSZP-SZDSZ, so if it is higher it is because MSZP and SZDSZ did not negotiate a market price, but a higher than market price for the gas. By the way there is no such thing as “open market” for gas, as gas is not easily portable. You need huge pipelines to transport gas in an effective way. Completely false. Not only the gas deal is not a “done deal before yesterday” it is still not completely done. Where are you getting all this false information? What progress was made is significant but not all is done still. Putin gave his OK publicly to rewrite the previous contract in a way that decreases the volume. Without Putin’s approval the previous contract states that Hungary must “take or pay” huge amounts of gas still. Either pay for the gas (20 billion cubic meters) or take the gas (for which there is not enough capacity to store anyway). Once again it is completely false. The meeting had everything to do with the gas contract. If Putin does not approve the change in the contract the old contract remains in place. The old contract had volumes that Hungary MUST buy. A minimum amount. Take or pay. If Putin does nothing but leaves the old contact unchanged then Hungary would have had to pay for 20 billion c3 of gas by 2015. Per the demands of the current contract. So either Hungary violates the contract (which is unimaginable) or takes 20 billion cubic meters of gas it doesn’t need right now and has nowhere to store it. The Russian change to the contract (which is not final yet but was announced by Putin), is extremely neccessary for Hungary. Without the change approved by Putin, Hungary would have been in huge trouble. Even now the Russians can still change their minds, though that is unlikely because the public announcement. But if they wanted they could hold Hungary to the current contract, signed by MSZP and SZDSZ. If the Russians do nothing just demand : “We have a signed contract, you should honor it”. it would have been a disaster. During the background talk one of the journalists asked Orbán about the Russian offshore front company MET Zrt through which Orban gets his kickback. Orban replied that the company has nothing to with him. Orban will build the new South Stream. Neither Orban nor Putin are people who give something they decided to do. The West totally mis-under-estimates these people if it thinks South Stream is over. Far from it. There are many legal tricks how to get around the EU regulations and with a pipeline based on a new conception they will likely work. Hungary’s portion will cost a few hundred billion forints (about 1 bn euros), but this is not an issue if Orban wants it and a construction company in which he holds an interest will receive most of that money. Plus he promised to Putin and he wants to deliver. Always remember: from the West there can be no downside to Orban because the EU cannot for all practical purposes cut of financing, while Russia can turn of the tap. So Russia is stronger (even if Orban wouldn’t get rich beyond belief in the process) and so Orban will serve Putin. “Putin is the man of the future while Europe is the old Europe, the decadent West going down under its debt. It consist only of the Nietschean Last Men.” This is really the belief of Orban. The other is Paks 2. The project is on schedule, actually the parties are ahead of it. It is both parties (ie Hungarian politicians’ and Russia) interest to proceed as fats as possible to commit themselves to more and more spending. My conclusion is also that this was a hue win-win for Orban andf Putin. For Hungary it was a gigantic loss, however. Let’s not forget that Paks 2 was to cost 10bn euros. With this price tag – which does not include the price of dismantling, the building of the nuclear repository and other necessary building such as one or two Danube dams – the price of electricity would have been 3-4 times (!) as today. Now, as we heard yesterday, the price tag is already at 12bn euros. How on earth will this project (whose price tag will continue to increase) operate without taxpayer’s subsidies?? Also, those who think the EU could prevent Paks 2. Orban will NOT care about any decision of the Commission, because Orban knows that the EU cannot physically prevent him from building it, it’s not like the EU will call in the NATO to bomb Paks 2 if it turns out that Paks 2 is against EU competition laws. Once it’s been built (half built), even if it costs taxpayers’ money and unlawful subsidies for decades, Paks 2 will have to be operated. The EU cannot do a thing. Putin is winning and so is Orban. RTL Klub will soon cancel its news shows entirely. The media laws will be amended so that there will be no obligation for big channels to produce such daily programs. RTL may still keep a short one with Lolcat videos, but politics is over. This sounds like the deal the US entered into with Orban, I’m afraid. @Clubber, let’s not fall for every panicky piece of news. RTL Klub can’t afford this kind of move. Just visited the new site and didn’t find Eva’s latest post and the comments following it. Wolfi et al. I just put it up but unfortunately the omitted comments button will not come back. Visit the site now and see whether all is well or not. It should be. There must have been a very serious disagreement in Warsaw. Orban supports Putin and he told it so to the Polish. But Hungary is with the winner, so the Polish can get lost. Nobody’s going to respond to “tram”, the Fidesz troll? I wonder if they wait patiently for each daily post so they can be one of the first to respond to it, at least on days that are especially important for them, for whatever reason. First of all, the contract signed almost 20 years ago was probably for gas that was market value at that time. Since then, the market value has gone down. Second of all, of course there is a market value, since Hungary can get gas from other places (there is a new pipeline from Slovakia, for example), and Russia is charging lower amounts to other countries. If Orbán had wanted to, he could have bargained the price down. Other countries have done so. Thirdly, you claim that Eva is wrong, and that the deal is not completely done, yet you give no source for your claim, unlike her. Finally, why did Putin need to come to Hungary to do what his subordinate could easily have done, or what he could’ve done over the phone? None of your arguments stand up to logic, including the one about “take or pay”. Hungary would have to pay anyway, whether it takes the gas or not. There is no “or pay”, it’s “take it or leave it, but pay either way”. Besides, we could easily sell or even give the gas to another country, such as Ukraine. 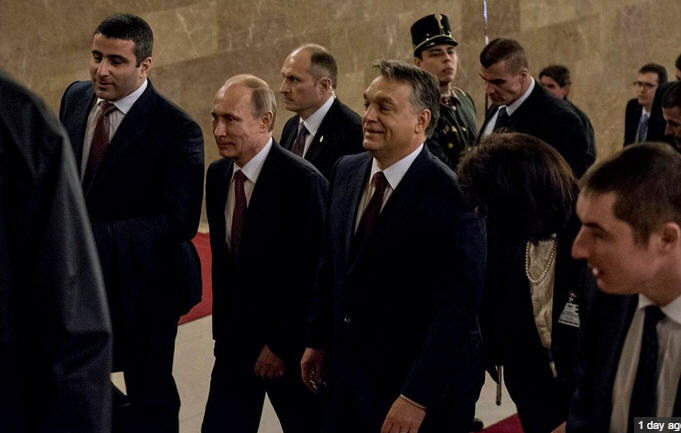 The only reason Orbán refused to do that is that he didn’t want to offend his patron, Putin. That’s the main point of the post. You might argue that doing so would go against the agreement in place, but that agreement is against EU rules, so is unenforceable, as the recent gas shipments to Ukraine by Hungary and others proves.